Optivisor w/Light Kit 2.5X at 8"
Optical Glass Prismatic Lenses - Ground and polished to precision optical standards - bevel edged and mounted in interchangeable plastic frame. It tilts - Adjustable pivots allow the visor to be tilted out of the way when not needed and at your fingertips when you need magnification. Adjustable Headband - Conforms to fit all head sizes - fabricated from a special blend of lightweight material - comfortable when worn for long periods of time. 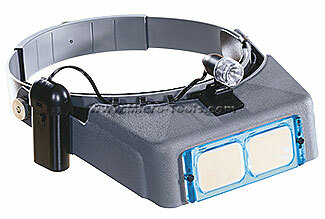 High Impact visor - Provides a tough, durable, always new appearance. Genuine Leather Comfort Band - Padded with orthopedic felt adds to comfort. Special Optiloupe attachment also available for extra power. 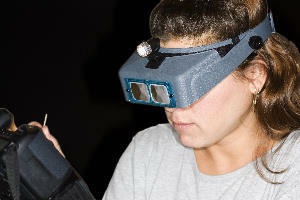 Other magnifications and replacement lenses available by special order. Hands Free Light, Xenon Laser beam. Light pivots to direct beam where needed. Clips Secure Wire To Head Set. 5 To 6 Hours Battery Life. With the 8" working distance, this gives you room to see what you are doing while cleaning a sensor.